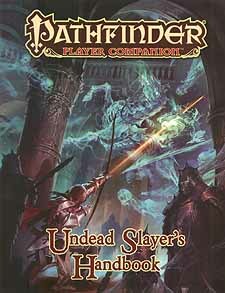 Discover the secrets of battling the undead with Pathfinder Player Companion: Undead Slayer's Handbook. From mindless zombies to diabolical liches, the undead horrors of Golarion are as diverse as they are numerous - and slayers of all walks are needed to return th3se dread monsters to their graves. Master the various tactics needed to identify and battle undying foes, whether you're a knightly order's professional exorcist, a scholar pursuing knowledge the undead possess, or a rogue undead hunter with reasons all your own. Details on the necrology of undead creatures, whether they're mindless skeletons existing only to serve or consummate vampires violently pursuing the dream of immortality. A thorough exploration of four character themes that cover the diverse tactics of various undead slayers, including the righteous exorcist, the thoughtful necrologist, the merciful redeemer, and the ruthless stalker. New class archetypes and character options that enable slayers from all paths to take down the undead in whatever manner they see fit. New adventuring gear, alchemical items, and slayer kits to make sure you have the tools necessary to lay undead creatures low. New spells, feats, magic items, and more to ensure your next encounter with the undead isn't your last.